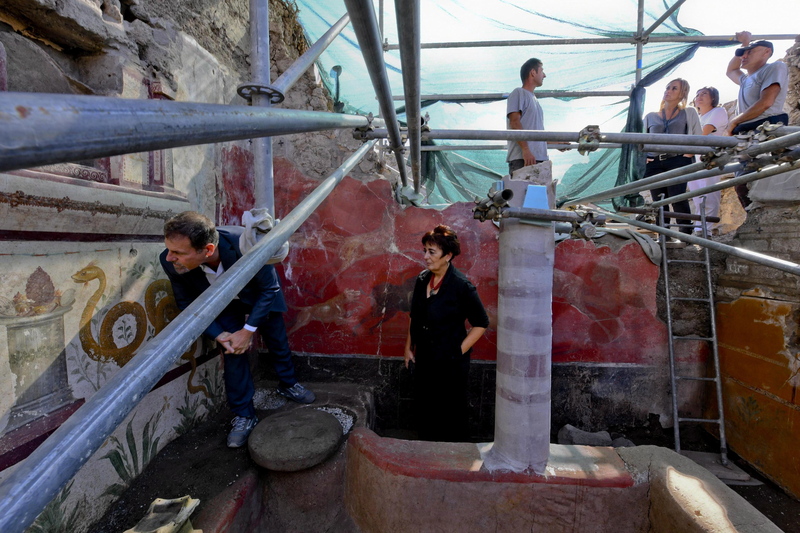 The excavation of Pompeii’s Regio V section has unearthed a house with an exquisite series of frescoes and a large shrine, one of the largest ever found in Pompeii. 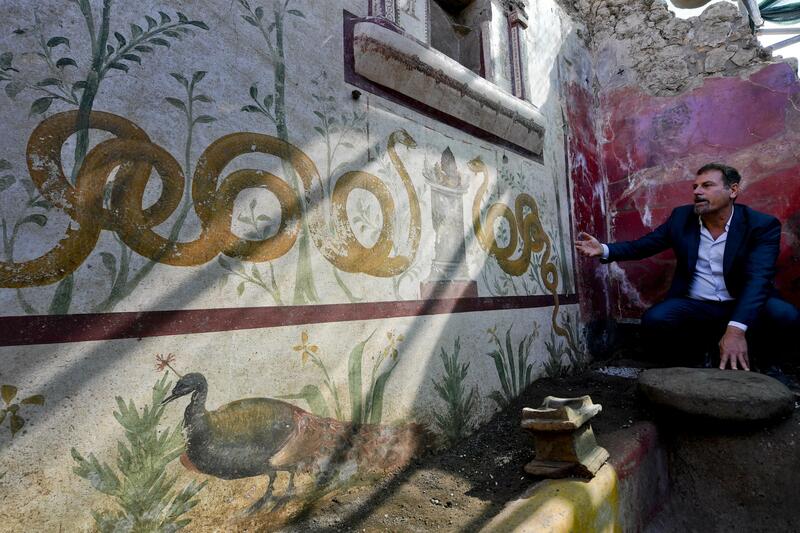 It is being called “the house of the enchanted garden” because of the rich wall paintings which retain their vibrant colors and have suffered surprisingly little damage from being buried in a cataclysmic volcanic eruption in 79 A.D. The only part of the house that has been excavated so far is the entrance, an open garden space where the lararium, a shrine to the guardian spirits of the household (the lares), was located in the center of riot of frescoed beauty. On each side of the shrine are green plants with small birds hovering over them and alighting on the branches. Under the lararium is a pair of large, sinuous snakes, wound around leafy plants, facing each other with their heads raised. Between them is an altar with a pinecone, a symbol of eternal life. Underneath the snakes is a garden scene with peacocks and yellow flowers (daffodils?). To the right of the lararium wall is a fresco painted against a full-coverage brilliant red background. In a remarkable dynamic scene, a black wild boar is attacked by a variety of gold and white animals — dogs and what appear to be dear and a horse. 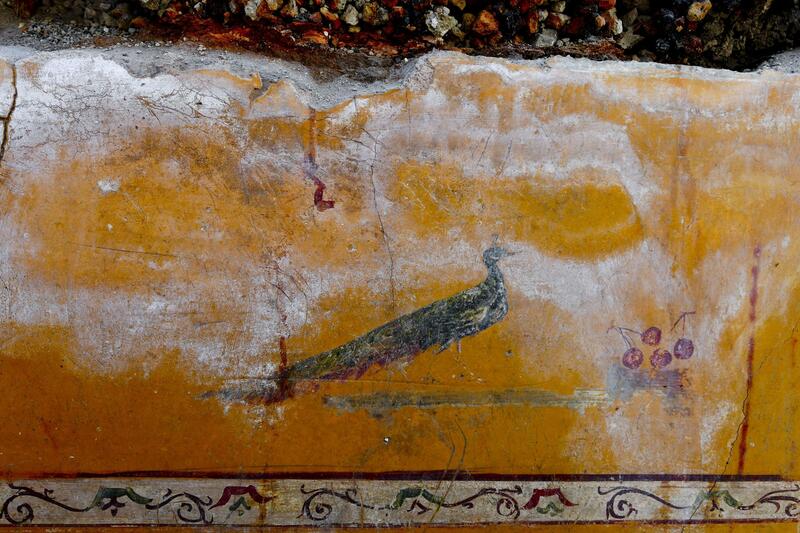 Next to it, across from the lararium, is another Pompeiian red wall painted with floral motifs. Another peacock stands proudly against a yellow ochre background. Snakes are often depicted in lararia because they were considered protectors of the home. 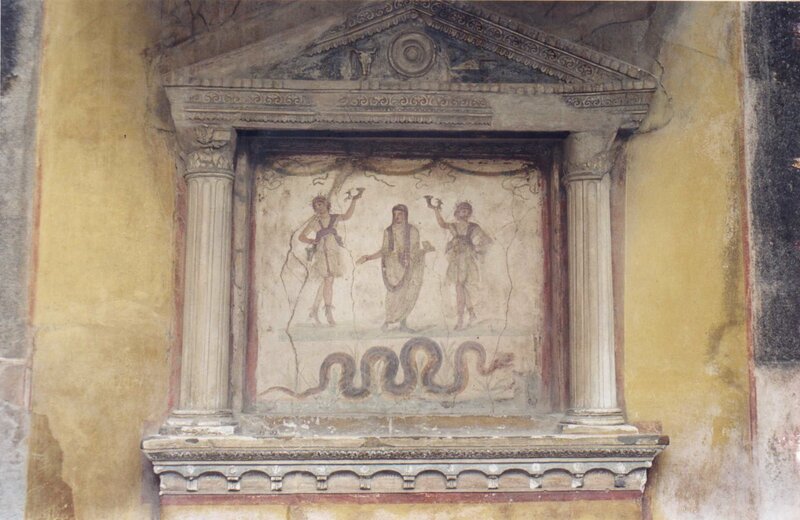 The well-known lararium in the House of the Vetti depicts the lares, the genius (the spirit of the paterfamilias) and serpent winding under the three of them. Like the House of the Vetti’s lararium, the newly-discovered one is built to resemble a small temple affixed to the wall. The Vetti shrine’s temple framework is stucco carved with Corinthian columns and a pediment with a highly decorative frieze, but no paint is extant. The temple surround of the enchanted garden’s lararium, on the other hand, is painted in deep red hues with vertical stripes, swirls, floral garlands and triangles on the columns and pediment. On each side of the central niche are lares, also painted red. The niche’s background, if it had one, is lost. At the foot of the shrine is a terracotta vessel that still contains the burned remains of an offerings, perhaps even the final desperate attempt of the homeowners to petition for rescue from Vesuvius’ wrath during the pumice fall that preceded the final destruction of the pyroclastic flows. That very moment is captured poignantly by a less overtly glamorous part of the house: a window, its iron grate still intact. Behind the grate are pumice rocks. They fill every nook and cranny of the space, mute witnesses to that first stage of the eruption in which the rain of stone poured in through windows and doorways until the interiors were crammed with stones. This beautiful garden was no exception. When the room up to the top of the window was filled with lapilli, the stones filled the space above the window ledge. 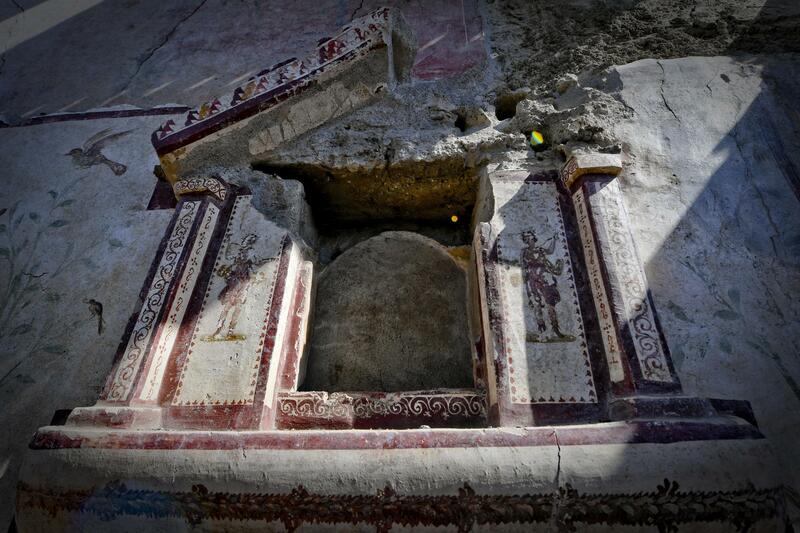 Archaeologists will continue to excavate this splendid domus which has at least two more rooms to explore. They will also dig into a small well found at the base of the lararium wall. It’s filled with stones from the eruption now, but wells can be archaeological treasure chests because people toss all kinds of things in them and the water helps preserve them. This entry was posted on Friday, October 5th, 2018 at 10:43 PM	and is filed under Ancient. You can follow any responses to this entry through the RSS 2.0 feed. You can skip to the end and leave a response. Pinging is currently not allowed. Think your attacking “dear” is a new critter unfamiliar to me . . . . Marvelous. 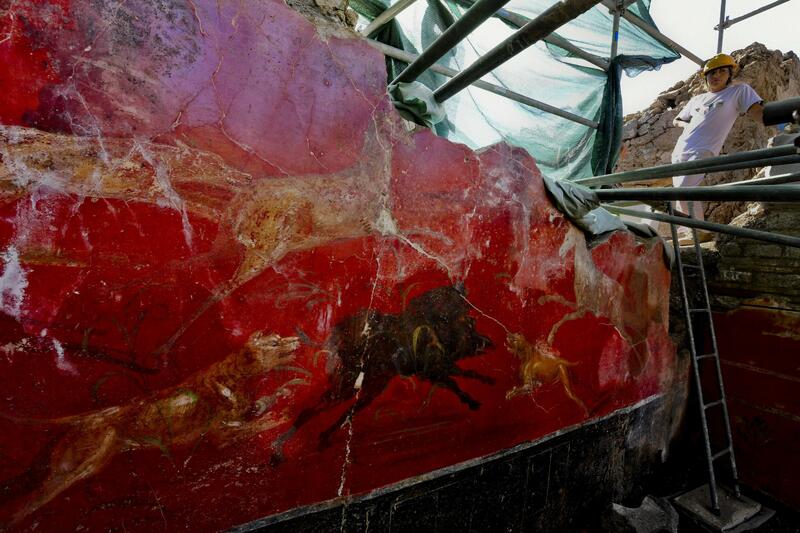 This helps me see what the more familiar frescos, now faded, must have looked like when they were first unearthed.